Ocean Outdoor and Outdoor Plus will mark today's Remembrance Day silence at 11am by suspending their usual digital screen schedule to display The Royal British Legion's Poppy Appeal ad for two minutes. The displays are part of a wider outdoor campaign to support the Royal British Legion's Poppy Appeal. The Legion is also celebrating its 90th anniversary this year. Inventory on digital screens has been donated by CBS Outdoor, Clear Channel Outdoor and JCDecaux since last Monday (31 October). 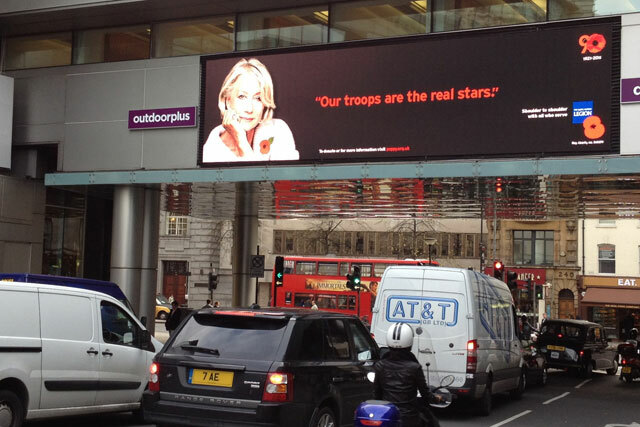 The campaign has been planned by Media Square agency CST The Gate and WPP's out-of-home arm Kinetic Worldwide. Space has been donated by the media owners. It includes traditional formats on the London Underground, roadside, point of sale and transport and encourages consumers to add a poppy to their Facebook profile photo. The poppy photos can then be posted to a wall on the microsite www.shouldertoshoulder.org.uk along with a message showing support of the Armed Forces. The Royal British Legion supports the armed forces community and through its Poppy Appeal, which marks the anniversary of the armistice signed between the Allies and Germany in 1918, ending World War I. Earlier this week Fifa was criticised for banning England football players from wearing poppies during their game tomorrow (12 November) but a compromise has been reached and the players will wear special armbands.